It’s 3am in Chinatown and April and Oyuki are still looking for leads on the gang war between the Golden Triangle and the Dog Stars. As April heads into a convenience store, Oyuki waits outside with a cig when young man named Kato strikes up a conversation with her. The two begin to hit it off and he invites her over to his place. The romance doesn’t last, though, when Kato spots a troop of Golden Triangles heading into the store and he ditches Oyuki. Inside, April keeps an eye on the Triangles, hoping to overhear something incriminating. Suddenly, a quartet of Dog Stars burst through the glass and attack the Triangles! The Dog Stars set the joint on fire and both gangs escape. April helps the owner out as Oyuki films the whole thing. The FDNY then arrive and Chu Hsi happens to be with them to put out the blaze. Chu asks April what’s going on but she blows him off, intent on following a trail of sweet and sour sauce left behind by a Golden Triangle who got doused in the stuff during the fight. 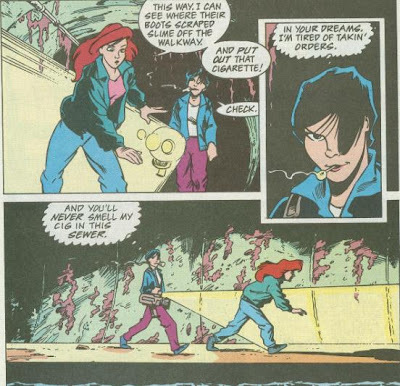 April and Oyuki follow the trail down into the sewer, where Oyuki secretly lights up another cig without April noticing. They follow the trail of footprints to the Triangles’ hideout, where the sauce-covered thugs report back to Wing Min. Wing spots the light from Oyuki’s cigarette and orders his goons to seize the interlopers. Oyuki drops her camera and escapes at April’s behest while the thugs grab the redheaded reporter. April demands to call-in Wing’s favor that she earned after the subway brawl with the Dog Stars, but Wing can’t abide her. Instead, he decides to call their boss, Johnny Yen. Topside, Oyuki rushes to Chu, but he can’t help her, as he’s still struggling to quench the burning convenience store. Oyuki then remembers that Kato had the symbol of the Dog Stars on his jacket and decides to go to the address he gave her. Deep underground, the mysterious shirtless ninja guy Johnny Yen is filling a goblet with a rejuvenating elixir when he receives word from Wing (speaking through a magic mirror) that they’ve got April. Yen teleports to Wing’s base and prepares to execute April. Conveniently, that’s when Oyuki and Kato arrive with a horde of Dog Stars. April is freed in the ensuing chaos as the Dog Stars use magical rope to subdue the Golden Triangles. 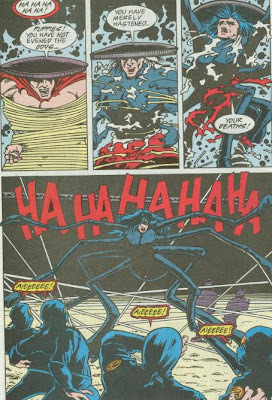 Not deterred, Johnny Yen transforms into a giant spider-monster and begins taking out the Dog Stars. As he bites a chunk out of Kato’s shoulder, Oyuki rushes to his aid, only to be bound in webbing. April draws her sword and challenges Yen, who transforms back into his human form to duel her. Naturally, that’s when even more Dog Stars show up to join the fray. But this time they’ve brought their leader… Chien Khan! Falling from his hotel window, Inky catches a lucky break and lands in a convenient swimming pool. 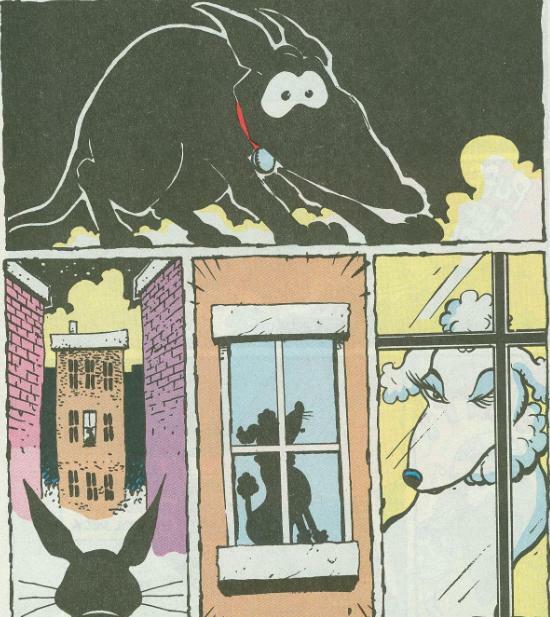 Wandering the alleys of New York, he spots a female poodle in a window who entices him with a wink. Excited, Inky rushes to her, only to be cornered by three large, vicious stray dogs. *This story is continued from April O’Neil #1. The story concludes in April O’Neil #3. *Chien Khan was defeated by April and the Turtles in TMNT Adventures #30. *Kato will still be in the hospital over a year later due to his injury, as seen in "The Fifth Turtle". 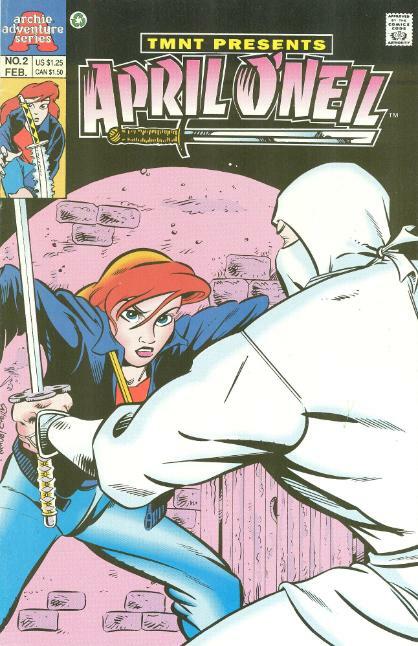 *The cover sees April being attacked by a White Ninja; soldiers who made up the ranks of Chien Khan’s previous army in TMNT Adventures. By this point in the series, though, Khan’s gang had become the Dog Stars with completely different outfits from the White Ninja. When it comes to three-issue story arcs or miniseries in the world of comic books, you’ll often find that authors have no trouble coming up with the beginning and the end… It’s all that stuff in the middle they spend less time contemplating. A lot of middle sections in trilogies tend to feel like the story is just spinning its wheels; killing time until the conclusion. In a relieving turn of events, the April O’Neil miniseries is quite the opposite, with the second issue being packed with a lot of action, narrative progression and exciting reveals. While Johnny Yen isn’t exactly the most engaging villain, being evil for evil’s sake (though looking pretty cool in the process), I think the highlight of this issue is the back and forth between April and Oyuki. Oyuki’s spunky and irreverent attitude clashing with April’s focused, take-charge demeanor makes for some fun exchanges as the pair do their freelance reporting shtick. What I like about Oyuki is that though she bumbles at the halfway point with her cigarette getting April caught, she’s no “bumbling sidekick”, immediately using her wits (and memory of a convenient flirtation) to right her wrong. A “bumbling sidekick” not only would have been captured too or in place of April, but would have required rescuing or something else to otherwise make up for their incompetence. Oyuki’s a good example of how the fun and perky “sidekick” character ought to be written. 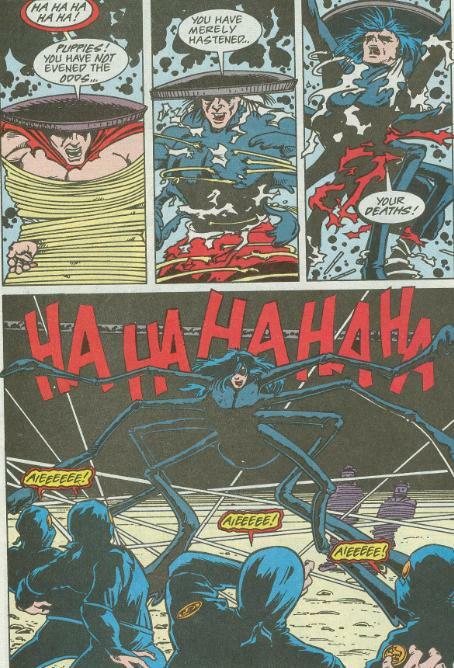 Back on point with Johnny Yen, his transformation into a giant spider sure was… unexpected. Cool, though. You’ll notice that when Johnny bites Kato’s shoulder, the blood is colored white to make it look like “drool”. Much to the irritation of Ryan Brown and Stephen Murphy (Dean Clarrain), Archie had a pretty strict “no red blood” policy and you’ll find that blood in this series is often colored anything other than crimson (most often black). Personally, I think blood is blood no matter what color the fluid is, but that’s censorship for ya. And, of course, Chien Khan has returned. The gang being known as the “Dog Stars” probably should have been a dead giveaway that he was pulling their strings, in retrospect. 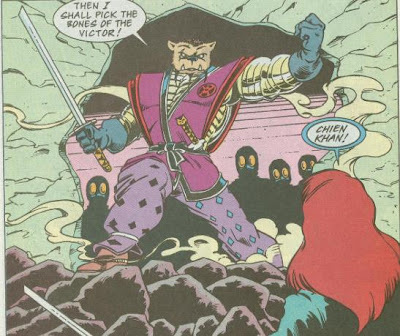 I’m glad the April O’Neil miniseries came along to continue the “Midnight Sun” storyline, as Khan escaping at the end created a pretty considerable loose end. On the subject of the Inky back-up, it’s still cute and expressive and a pleasant bonus, though nothing else much to say about it.